Keep sheltered from the sun or rain by installing a retractable patio awning. 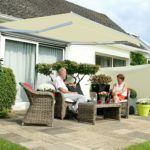 These retractable awnings allow you to sit out in the garden or patio without being affected by the sun or rain. However, unlike cantilever parasols which can freely be placed anywhere, an awning has to be fixed to a solid construction such as the wall. Despite being able to shield you from certain weather elements, it’s not recommended that it’s used when experiencing strong winds as this can damage the awning. 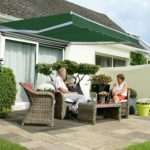 Since buying the right patio awning is imperative as it’s not so easy to just simply take it down and return it, you should learn about the different types of patio awnings. 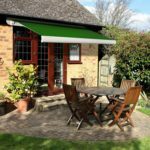 Having an awning requires someone to install it which can put some people off, you will require another set of hands or two to help you install it. Although this is not that complex it still can scare away people who hate the thought of DIY. Alternatively, you can opt for a pop up garden gazebo which has similarities, check out our comparison on the two. 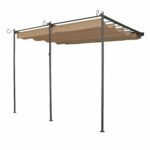 When buying the best retractable awning for your patio or garden, taking into account the features listed below can help narrow down your choices. Width – Above the back garden door is a very common place to have the awning fitted, therefore you’d probably want the width of the awning to at least cover the whole width of the back garden door. Maximum projection – Furthest the awning can come out, it doesn’t have to be extended to the maximum projection distance, it can be anything in between. Fabric – Hard wearing polyester is usually used because it is waterproof and PU and VU stabilised. Polyester is also easy to clean. Adjustable angle – Many models will allow the arms which support the awning to be tilted up to a certain angle. This is useful if you want to block more sun or rain from coming in. Opening type – Manual awnings are usually operated by either a crank handle or pull string, ones that are operated manually are usually a lot cheaper. Electric awnings are opened and closed by using a remote control, a lot more stylish and convenient of course but more expensive. 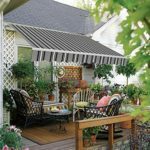 Before you make a decision, it might be worth knowing about the main types of patio awnings in case there’s another option that might be a better candidate. 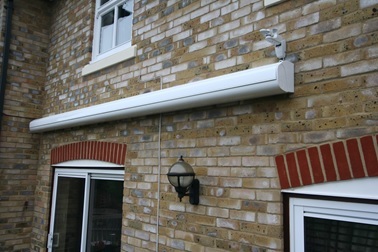 Standard – A very popular choice, can only be manually operated and has no built-in weather cover when fully retracted. However, you can simply buy an awning cover protector which will protect it from weather elements and keep it clean when it’s not in use. Half cassette – Can either be manually or electronically operated, it can usually withstand weather conditions better because the awning is protected by a metal cover when closed. Full cassette – Again, it can either be manually or electronically operated, however the awning including the fabric will wind completely in a metal cover for full protection. Full cassette awnings are the strongest type but also the most expensive. Although these are two different products, they share some similarities, thus they can be compared to one another in some ways. A garden gazebo is a worthy consideration because it provides shelter from certain weather elements too. Solid fixture that doesn’t get in the way as it’s mounted to the wall. More durable against weather elements. Looks more presentable and sophisticated. Takes less than a minute to extend or retract the awning. Requires 2-3 people in total to help with the installation. Even basic models can be quite expensive. Can only be used in one location. Portable so can be placed anywhere. Can easily be erected or taken down. Space saving as it can be stored away when not in use. Side panels can be put on or taken off to your liking. Not as solid as it’s not a permanent fixture. Looks a little bit tacky.